During the Foundation Service Seminar, London, 2013. FPMT service seminars provide support and training to those offering service, and those wishing to offer service, within FPMT centers, services, and projects. The seminars help develop a shared understanding of the FPMT mission set out by Lama Thubten Yeshe and Lama Zopa Rinpoche, and a firm basis to serve joyfully and effectively within the organization. We offer a variety of service seminars for center directors, study group coordinators, spiritual program coordinators, center staff, volunteers, registered teachers, and anyone interested in offering service to Lama Zopa Rinpoche and the FPMT organization. The Foundation Service Seminar is, as its name suggests, the required entry point to the more specialized service seminars. The Foundation Service Seminar (FSS) is the ‘FPMT immersion retreat’. It provides essential information and nourishment for all serving, or wishing to serve, in the FPMT organization. 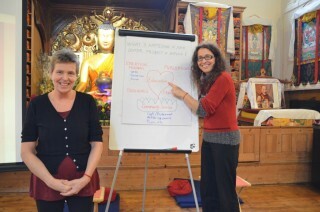 As it is so important, it is the foundation for each other specialist FPMT service seminar. The FSS Retreat is key to deeply understanding the FPMT organization, and the attitude we seek to cultivate as we offer service in the organization. This experiential retreat helps us actualize the advice that service is practice, and that practice is service: and how to always enjoy and rejoice when offering service. The FSS Retreat is a five day retreat. The FSS Retreat explores how to best offer our skills and qualities in service. We investigate the purpose and mission of the FPMT organization, what it means to be an FPMT center, project or service: and how that vision translates into action for individuals. We explore our relationship to resources – both material and human; effective communication; team building; ways to maintain and develop our personal practice in the midst of service; skilful people development and management; and methods to prevent and cure burnout. We discuss service in terms of guru devotion, karma, compassion, and emptiness, and how to draw strength, inspiration, wisdom, and guidance from these practices. We use the Inner Job Description, a tool for developing what Lama Zopa Rinpoche calls the “inner professional” (read a teaching on the inner professional), and to integrate the Dharma into our daily lives. The training includes group discussion and sharing of experiences, and includes daily meditations as well as group practice as advised by Lama Zopa Rinpoche. While fulfilling our larger purpose to benefit sentient beings, FPMT is also a family of Dharma practitioners. Lama Thubten Yeshe used to refer to the importance of cultivating a “family feeling” within FPMT. The Seminar Series, and particularly the Foundation Service Seminar, emphasizes our connections to each other, and how to keep those connections harmoniously. I attended this seminar starving for guidance and have not been disappointed. I have been fully fed and watered and leave happy, satisfied and totally inspired! As mentioned above, the Inner Job Description is a great tool for developing mindfulness about our thoughts, speech, and actions. It is available for all to use, via a paper format or a free app. The app is available in English, Chinese, French, Italian, Russian and Spanish. Rich, multilayered teachings were delivered with wit, compassion and wisdom. This training changed my life! This is currently unavailable as we are updating the resources. The week long Rituals Service Seminar provides in-depth instruction on Lama Zopa Rinpoche’s method of leading the pujas and practices that he most often recommends for FPMT centers and students. Encompassing Essential Buddhist Prayers, Vol. 2 and Lama Chopa, students learn how to set up the altar, lead motivations and meditations according to Rinpoche’s style, and the specific tunes used by Rinpoche for these pujas. Rituals Training was very inspiring, making me want to practice these rituals. I understand their purpose much better now! Spiritual Program Coordinator Service Seminar assists SPCs in developing their skills in counseling, planning center programs, leading meditations and/or classes, and acting as a key player in the harmonious functioning of the center. Participants have both individual and group opportunities to practice the skill areas emphasized in this week-long training. This is designed for FPMT registered teachers, introductory course facilitators and meditation leaders. It will introduce principles of contemporary Dharma pedagogy (method and practice of teaching), within the context of the unique FPMT lineage. During the seminar you will explore areas of specific interest to those teaching and leading meditation within FPMT centers, including course planning. The seminar is experiential and participatory, and is suitable for experienced Dharma teachers and complete beginners alike, as it stimulates reflective practice and professional development, which are essential processes for everyone helping others learn Dharma in FPMT education programs. The seminar is designed to help participants improve their skills in enabling others to grow and develop deeper understanding of Dharma. It isn’t sufficient for a good Dharma teacher to have lots of knowledge or personal experience of the teachings: it is also important to become skilled in communicating this experience and understanding to others in a way that helps them gain insight and inner transformations. The Teacher Development Service Seminar has been designed as the ‘next step’ for registered (or almost registered) teachers and introductory class leaders who have graduated from a Foundation Service Seminar (FSS). The FSS is the ‘FPMT immersion retreat’ foundation for this and other specialist service seminars, and provides essential information and nourishment for those teaching in the FPMT organization. The Foundation needs teachers who understand and are aligned with FPMT history and culture, therefore graduating from an FSS is enormously helpful and extremely important for all current and future teachers. The TDSS is designed as a 3 day retreat (eg: starting on a Thursday evening, and finishing on the Sunday late afternoon). Certification requires participation in the entire seminar. 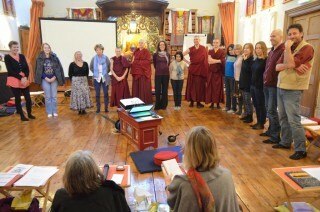 The style of the seminar is interactive and participatory, and those who participated in the pilot seminars confirmed that they came away enriched and inspired to support Dharma learning more effectively. We encourage FPMT registered teachers to participate, and directors and SPCs to encourage promising introductory class leaders and meditation leaders to attend. To find out when an FPMT Service Seminar is scheduled near you, or if your FPMT center, project or service would like to host a Foundation Service Seminar or any other Service Seminar, please contact your regional or national coordinator. If you feel that you would like to understand more about the Foundation Service Seminar before committing to participate, we have created a short Taste of the Foundation Service Seminar – to introduce and help people understand the benefit of an FPMT immersion training via the FSS retreat. Again, please ask your regional or national coordinator if a Taste is scheduled near you.